If I could have a big bowl of fresh raspberries in my refrigerator at all times, I’d be one happy girl. Actually, make that three happy girls in this house; we all love those vibrant ruby red berries just the same. They are happiness, in the most wonderful form possible, straight from nature…pure, sweet, wonderful joy. Now just imagine the joy you could bring to someone by setting one of these Chocolate and Fresh Raspberry Cream Napoleons in front of them. Small in size, yet bursting with fresh raspberry flavor, these little beauties are sure to win anyone’s heart. It’s a pretty rare occasion when you open our refrigerator and can’t find a package of Driscoll’s berries in there. 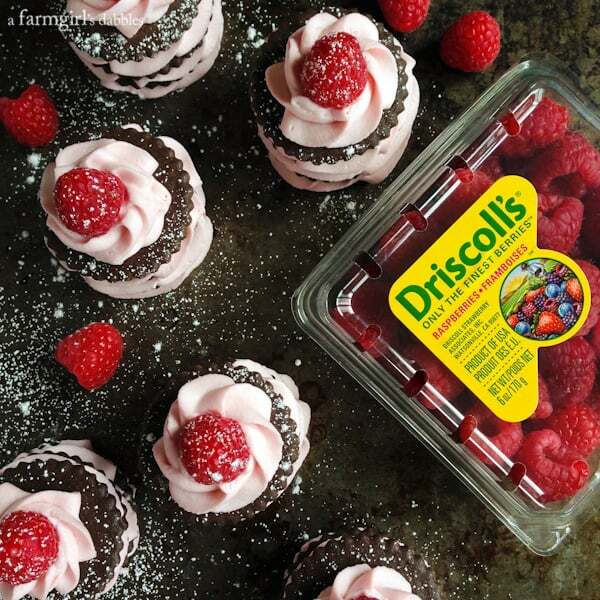 Raspberries, blueberries, strawberries, blackberries…Driscoll’s has us covered for fresh juicy berries year-round. So when Driscoll’s asked me to create a dessert featuring their raspberries, I needn’t think twice, because raspberries naturally equal dessert. Raspberries are my perfect treat, one that requires little more than popping them straight into my mouth for instant sweet indulgence. I was definitely up for a little creativity in the kitchen with them. Because you know me…I love my berries, and I can never pass up dessert! To see my raspberry dessert on the Driscoll’s site, just click here. 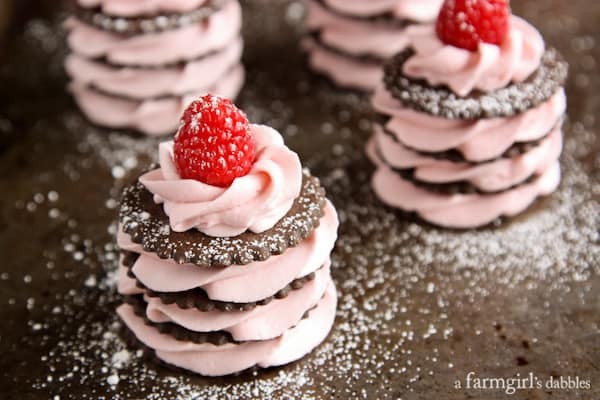 Also be sure to check out all the other beautiful raspberry dessert recipes on Driscoll’s! I’m such a visual person. Pictures always help me to envision what I’m aiming to achieve while developing a new recipe. And our girls always get such a kick out of the illustrations I create, so I thought I’d share this one with you, too. I don’t always get out the colored pencils or draw little hearts, but especially fun recipes always receive a little extra flourish on the paper. 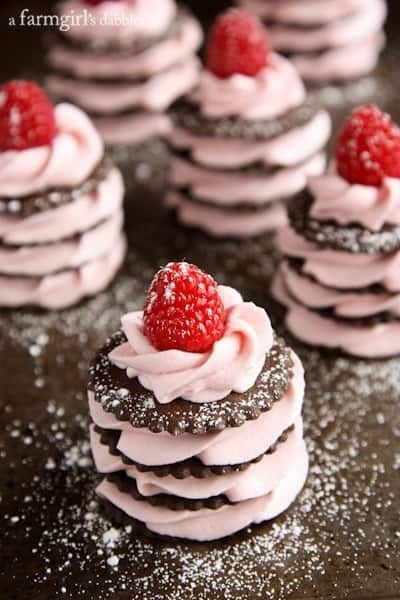 These individual mini desserts are constructed in true Napoleon form, with alternating layers of cake (in the form of thin chocolate cookies) and fluffy raspberry cream. Ruffly and oh-so-pretty, delicate yet firm, this cream is nothing short of amazing. 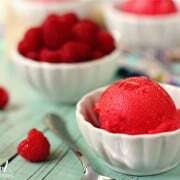 It is pure raspberry flavor and color, with no extracts or dyes added. And the fresh raspberry adorning the top brings it all together, giving you a fresh burst of bright berry flavor. We found out that there are two very distinctly different ways to eat these Napoleons. When eaten as soon as they are constructed, the cookies are super crisp, cracking as your fork lowers down onto the plate, squeezing out that wonderful raspberry cream. And when you place the Napoleons into the refrigerator to chill for a few hours, something magical happens. 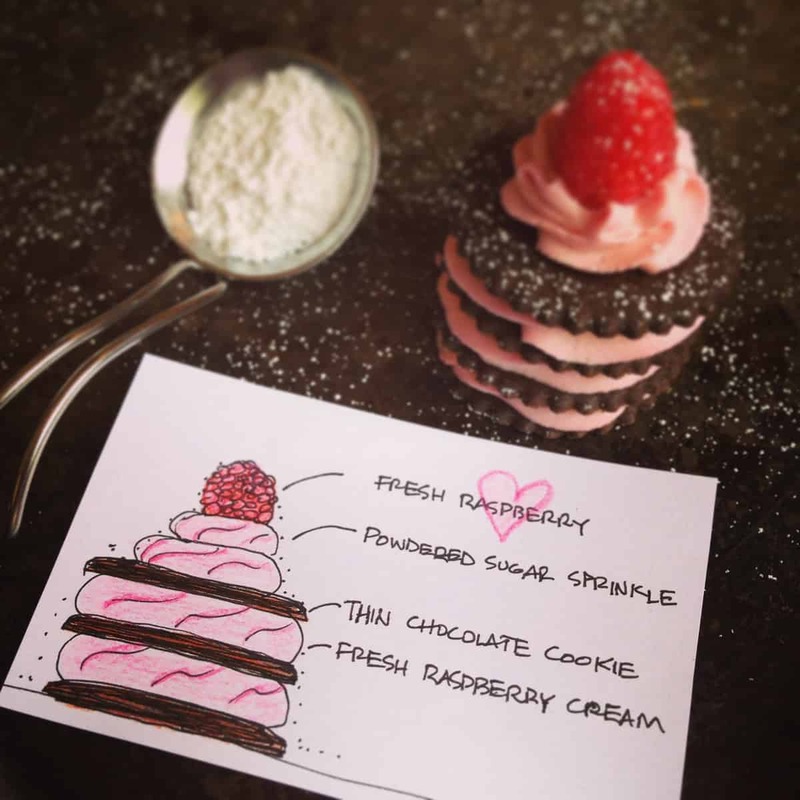 The raspberry cream firms up a bit more and the chocolate cookies start to take on the moisture from the cream, transforming the cookies into the thinnest layers of soft cake imaginable. When your fork eases through the dessert, it cuts like a knife, revealing the gorgeous pink and dark chocolate brown layers within. It’s a completely luscious experience, and our preferred way to add a little raspberry Napoleon joy to life. You can see my Chocolate and Fresh Raspberry Cream Napoleons on the Driscoll’s site here. Be sure to follow along on social media with the hashtag #RaspberryDessert. And for more raspberry recipes and inspiration from Driscoll’s, click here. I promise you, those pretty raspberries and desserts will have you thinking about making your own dessert in no time at all! 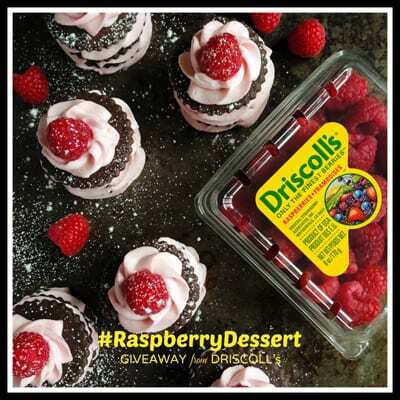 I’m also happy to share this #RaspberryDessert giveaway from Driscoll’s with you. You could WIN $100 worth of berries! Cook the 12 ounces of raspberries in a medium saucepan over medium heat, stirring frequently until the raspberries are broken down into a sauce. Line a fine mesh strainer with 2 layers of cheese cloth and set over a bowl. Pour the raspberry sauce over the cheese cloth to remove the seeds. Gather up the ends of the cheese cloth and press out all the raspberry juice with the back of a spatula. You should be able to get at least a half cup of juice from this amount of berries, but I can usually press out almost 3/4 of a cup. Pour the raspberry juice back in the saucpan. Simmer over medium to medium-high heat until the juice reduces to a 1/4 cup. It will be a very rich red and concentrated sauce. Set aside to cool completely. To speed up the cooling, the sauce can be placed in the refrigerator to chill. In the bowl of a stand mixer, with the whisk attachment, whip the cream on high speed until stiff. Remove whipped cream to another bowl and set aside. In the same bowl of the stand mixer (no need to clean the bowl first), with the paddle attachment, beat the cream cheese on medium-high speed until very smooth. Add the 1/4 cup of prepared and cooled fresh raspberry sauce and mix on medium to high speed until combined and completely smooth. Then add the marshmallow cream and mix again on medium to high speed until combined. With a rubber spatula, gently fold in reserved whipped cream until combined. Spoon fresh raspberry cream into a piping bag fitted with a large open star tip and pipe it onto the top of one chocolate cookie. Top with a second cookie and pipe on more raspberry cream. Repeat until you have a fourth cookie on top. Then swirl on a smaller amount of raspberry cream to the top cookie. Gently press in a fresh raspberry. Use a thin metal spatula to transfer finished napoleon to a serving plate or platter. Repeat until all napoleons are finished. Alternately, you could use a small spoon to layer on the raspberry cream, for a more free-form look. Right before serving, sprinkle powdered sugar lightly over the tops of the napoleons. Serve immediately for a crispy chocolate cookie experience. Or refrigerate for at least 2 hours for a softer chocolate cookie. Both ways are completely delicious, but two entirely different experiences. 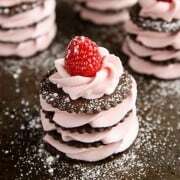 When the napoleons are left to mingle and chill for a couple hours, the chocolate cookies take on the moisture of the fresh raspberry cream, yielding a dessert that is eaten just like a small layer cake. It’s very fun! This post is sponsored by Driscoll’s berries. 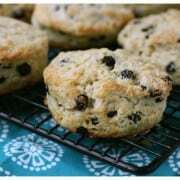 Visit www.driscolls.com for more berry recipes. All opinions are 100% my own, as always. Thank you for supporting the brands that help make this site possible! 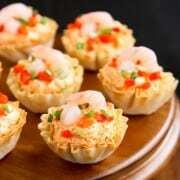 I am planning to make these for our Easter luncheon. How do they do if they are constructed the day before?? Do they get too soggy? Oh sweet Mamma. I need these. Now. I found your blog from foodgawker and I just adore it! Photos look super duper amazing! These look amazing. Raspberries are my favorite and this desert is a great way to use them. Okay, I totally LOVE these! They are adorable and now I need to find a way to make a low carb version. It shouldn’t be too hard, but I will need to make my own chocolate wafer cookies. Thanks for the inspiration! The berrilicious and chocolaty colors of this dessert led me here! They are totally darling and looks delicious. I love berries just as much, – by themselves or using to create something yummy, especially desserts! How beautiful and professional-looking! This has gone on my ‘beautiful food photography’ Pinterest board! I love your beautiful illustration! How fun to include your girls, and love that you have recipe ideas swirling around in your head and draw them out. Raspberries are my fave. Love fresh raspberries and this is so irresistible! These are so gorgeous, Brenda. And love how easy the recipe is! Gorgeous napoleons, Brenda! Love fresh raspberries! this is beautiful!!! love and pinned! This dessert is beyond impressive looking. 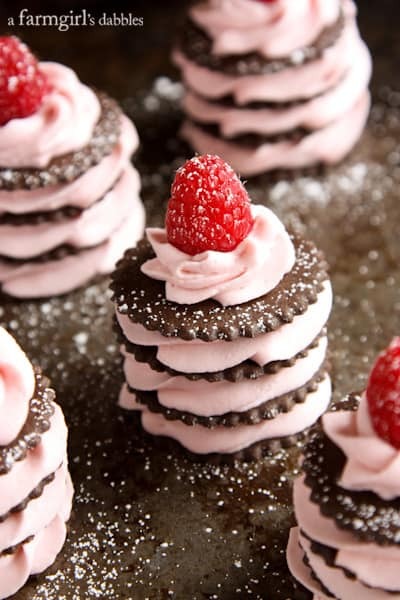 Raspberry cream and chocolate together are a match made in heaven. Father’s Day is coming up and my husband loves anything napoleon and so do I. I can’t wait to make this! What a gorgeous, yet simple dessert Brenda! I saw all of you Land O’Lakes ladies at Pizzeria Lola last night via Instagram: looked like so much fun! I would love to be part of such a wonderful group of bloggers! I’m so glad you re-posted this! I saw it in my newsletter, then when I went to click on it, couldn’t find it on your site. I was really disappointed. The presentation of this is fab! Love it! You go, Girl. This is inspired. So elegant! What a wonderful treatment for fresh raspberries. These are so beautiful!! Never heard of these before but will be trying soon for sure! Love this, so gorgeous and chocolate and raspberry is a terrific flavor combination. These are so pretty!! Love fresh raspberries!